I’ve been pretty complacent during DC’s rollout of the New 52. It hadn’t affected any characters that I cared about. Everything was fine – I had nothing to worry about. Until now. I now understand what every Superman, Flash or Wonder Woman fan has been going through these past twelve months – because DC finally came for the one character that I really cared about. 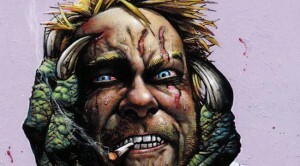 DC have snatched the Hellblazer, one John Constantine, from Vertigo. Hellblazer will end at Issue 300, with John Constantine continuing a life in Justice League Dark and a new series of his own called Constantine, which ties in with JLD. All under DC, not the mature imprint that is Vertigo. I’ve glimpsed the new John C in Justice League Dark and I’m not happy with how they’ve neutered the character. Sure, in the current Hellblazer comics John is old enough to by my dad, but even in his younger days – Constantine was nothing like the Constantine of JLD. If you were to hold up a Polaroid of the John Constantine from the first twelve issues of Hellblazer, against a Polaroid of DC’s new ideal of John C… The one from the 1980s would be crouching quietly in a corner while doodling a pentagram on the floor in his own blood, ready to let loose some hellspawn on the skinheads that just tried to do over an old lady. The DC Constantine’s Polaroid, in contrast, would show a man that has never killed any of his friends or stood-up for the welfare of others. In fact, this Constantine would be sat in a bar, drinking a JD and coke while bouncing someone like Zatanna on his lap and have hardly a care in the world. Okay, so this Constantine hasn’t lived long enough to make all the mistakes that Hellblazer has, but Hellblazer had made mistakes right from the very start of his magical career – the worst DC’s has done is fall in love with Z and trust other people. This is what galls me with the cancellation – the fact that not only are they ending a mature comic book series, but that the changes to the character’s character are so fundamental to his outlook and interaction with his fictional world. It goes way beyond Clark Kent not being with Lois Lane. Liberties, large liberties, have been taken with the character by Peter Milligan in JLD, and no doubt further liberties will be taken in Constantine when it launches next year and is being written by Robert Venditti. And it’s like DC just doesn’t have a grip on why people like myself, people like Paul/Retroid (who co-hosts Nerds Assemble with me) and many of my friends like Hellblazer. 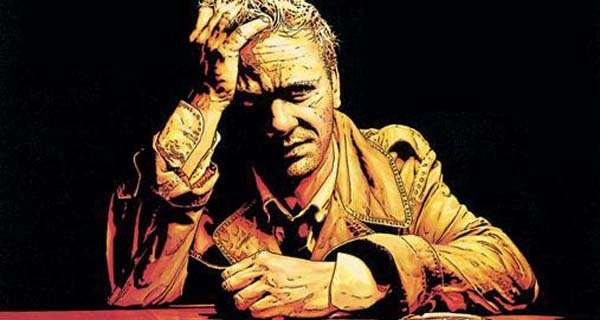 At his core, John Constantine, Hellblazer, is not a character who pursues glory and chases approval. He is a protagonist that is so heavily flawed, has such a checkered past, that he is believable. He doesn’t want to save the world – he just wants to go down to his local and have a quiet pint, but, but, if he does see a little old lady being menaced by a bunch of yobs – he’ll step-in, instantly regret it, and end-up in hospital. He does not actively pursue to enhance his magical abilities for the sake of it – it’s just something he’s found that he’s haphazardly good with and often would rather not go near. If DC wanted a character like John Constantine in the New 52 universe, then they should have just created a new character. Hell, John Constantine is old enough to be my dad, which means they could have created a son or daughter of his that he just happened to not know about and could have had him/her now running about with Justice League Dark. 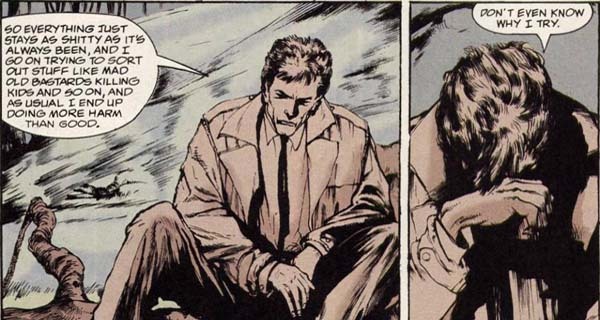 The thing that marks John Constantine out as John Constantine is the diabolically huge amount of personal tragedy that the character has gone through. Without this background, without the self-loathing it creates – DC are not publishing a character that is the Hellblazer and is certainly not John Constantine. You can listen to further thoughts on the cancellation of Hellblazer and more in episode 15 of the Nerds Assemble podcast. Games, film and comics lover, I'm helping out with comics coverage here & I'm behind the Nerds Assemble podcast. Is Judge Dredd about to come out as gay?